Hello my lovelies and welcome to my new post! If you follow me for a while you know that I am a big fan of subscription boxes and surprise boxes. There is just something about knowing you will get something awesome but still being surprised by what it is! That is why today I have a very special Blippo review (and an international giveaway of course) to share with you guys! Today we will be checking out together a Blippo Surprise Kawaii Mixed Bag that recently arrived to my doorstep. The bag was neatly packed in a box so it arrived in a perfectly well condition. In Blippo Surprise Kawaii Mixed bag you get a mix of at least 15 products picked out randomly from their kawaii warehouse. The retail value of the items in the bag is approximately 45$, while you can get the whole bag for around 18$ with free shipping! 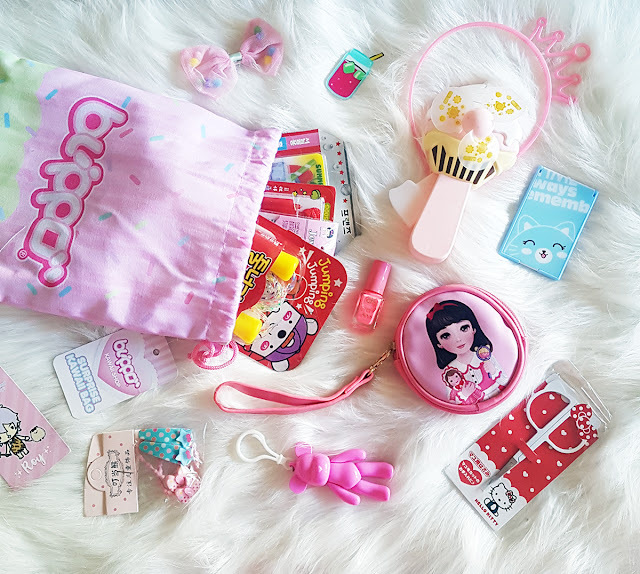 Let's check out the items I got in my Blippo Surprise Kawaii Mixed Bag! First two things are both adorable but also quite handy for the warm days. One of them is a cute colorful fresh summer juice fan that is also quite practical and harder to break in your bag than regular paper fans. The other one is a small manual fan in the shape of an ice cream! It doesn't get any more kawaii than that! Second two items are also quite sizable. First one is super cute Korean notebook set in red edition. It's great for keeping your notes with you at all time. Second one will make one of my little cousin very happy - skipping rope never goes out of fashion. And here are some items that I really love. First of all, there is a panda sleeping mask! I mean, who doesn't need a panda sleeping mask in their life? Also I got a pair of small scissors and a pocket mirror. I am very happy that surprise bag contains so many useful items! Also you can see a sparkly stickers set that I always use to decorate different stuff around the house, including gift wraps. Here are the pink kawaii items that I believe any little girl out there would be so happy to have. Here you can see a set of hairpins, a flexible pink bear bag charm, pink nail polish, adorable pink bow and a small bag you can carry with you! Last but not least, these are my two favorite items. The items in the middle is a cute brooch that you can put on your clothing as well as on your bag. And the pink hairband with a crown is simply a must-have, no matter what age you are! I hope you enjoyed my review my lovelies. Also you will get a chance to win Blippo Surprise Kawaii Mixed Box by entering below! There are 15 ways to enter the giveaway. Shipping is free and giveaway is international. Giveaway lasts until 27th October when winner will be chosen randomly. Good luck my lovelies! Oh my goodness, everything is so so cute! My favorite is the nail scissors, so cute! I like the panda sleeping mask. Thanks for the chance to win. My favorite is the cute Korean notebook set! I like the pink crown hairband. My daughter would wear that every day!